Known as the "Mother Temple" in Bali, Pura Besakih is situated 3,000 feet up the slopes of Mount Agung in East Bali. Pura Besakih, considered the most important Hindu temple in Bali, is actually a complex of 23 separate temples that can be explored by tourists. Pura Besakih made the world spotlight in 1963 when the temple - thought to have been saved by the gods - miraculously survived a devastating eruption by Mount Agung. Pura Besakih was nominated as a potential UNESCO World Heritage Site in 1995. Culture Crush: read up on Bali's culture. The Pura Besakih temples are thought to date back to the 14th century, however some locals date them back as early as the 10th century. 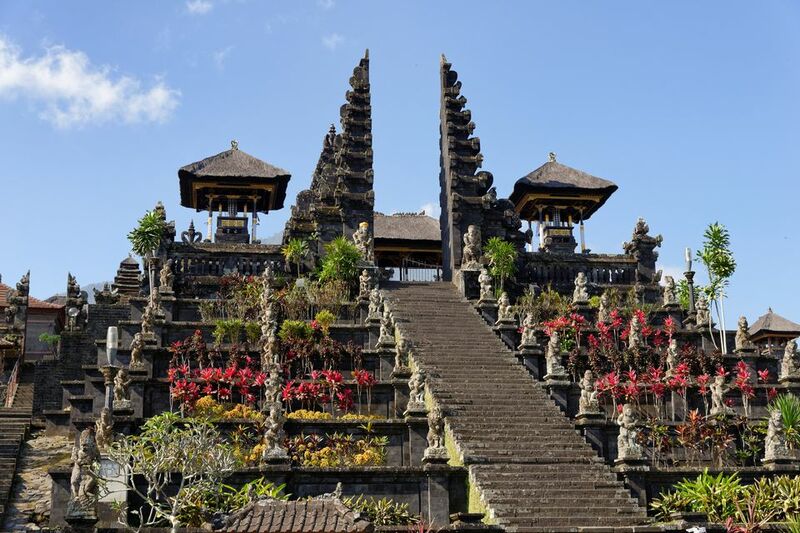 Constructed on seven ascending levels, Pura Penataran Agung is the epicenter of the temple district. A giant stairway, decorated by carved figures from the Ramayana and Mahabharata, allows pilgrims to ascend to the top. Multicolored banners flying around Pura Penataran Agung denote the temple's dedication to Shiva, the destroyer god of Hinduism. The other gods of the Hindu trimurti are also remembered in Pura Besakih; Pura Batu Madeg, devoted to Vishnu (the preserver), can be found to the northwest of the aforementioned temple, with gorgeous spires reaching out to the sky. And Pura Kiduling Kreteg, devoted to Brahma the creator, lies across a gully to the southeast. These and 19 other temples spread across the complex represent the holiest of holies for the devout Balinese, who come to bring gifts for the gods and take back holy water from here to use in temple ceremonies in their home villages. Temple run: Find out more about Bali's top temples. Each of the individual temples in Pura Besakih has its own odalan, or temple festival; you're almost certain to come across one being celebrated whenever you visit the temple complex. Batara Turun Kabeh: the eve of the tenth lunar month marks the high point of a full month's festivities, the name of which translates to “the gods descend together”. The Balinese believe the gods of all temple shrines on Pura Besakih simultaneously descend to earth during Batara Turun Kabeh, and villagers from all over the island converge to offer them sacrifices and celebrate. Watch the purification pilgrimage, where Balinese make a slow procession bearing heirlooms and holy objects, all to be sanctified in the temple's holy waters. Odalan of Pura Penataran Agung: the odalan (temple festival) of Besakih's biggest single temple occurs every 210 days. Come for the spectacle of thousands of Balinese converging on the stairs ascending the terraces, and praying facing the largest temple bearing altars to the Hindu trimurti. Pura Besakih and other loosely-connected Hindu temples around Mount Agung can be explored on a day trip from Ubud or Denpasar. Tourists can wander from temple to temple; each site differs according to deity and purpose. The Pura Besakih temple complex is extremely active; scores of different Hindu ceremonies are held throughout the year. Pura Pentataran Agung and other temples may be closed to tourists during special worship days - ask in Ubud before making the journey to Pura Besakih. While tourism has caused the region around the temple complex to explode in growth, the popularity has attracted a horde of guides, touts, and hawkers hoping to relieve visitors of extra cash. Pura Besakih is open from sunrise to dusk, however tour buses begin to pour in around 9 a.m. In Hindu belief, the Eka Dasa Rudra ceremony must be performed every 100 years to purify and save the world. The ritual was scheduled to be performed in 1963 at Pura Besakih. In March of that same year, Mount Agung erupted violently blowing the top 400 feet off the volcano. Thousands are thought to have died on Bali as gas and lava spewed from Mount Agung. Miraculously, Pura Besakih remained relatively untouched on top of the volcano as lava poured down the slopes. An entrance fee of only $1 is charged at Pura Besakih, however an additional donation is expected. Trivial fees of less than $1 are charged for parking, cameras, and video cameras. Other temples in the area may charge additional entrance fees; always pay directly at the entrance and not to the numerous people loitering around the temple to exploit tourists. The numerous scams and excessive hassle around Pura Besakih ruin the entire experience for many tourists. The temple is sadly exploited as a way to shake tourists down for money; people will literally be lined up as your car or bus arrives in the parking lot - be prepared! Take your own sarong: Proper dress is expected inside of Hindu temples; men must cover their legs with a sarong. Sarongs can be rented at the entrance of each temple, however purchasing your own in Ubud is a better idea. Do not overdo donations: Upon entering each temple, you will be pressured to give a donation. A logbook of previous guests will show exorbitant amounts of $10 - $40. A typical donation to other Hindu temples in Bali is typically around $1. Read about other scams in Southeast Asia. Pura Besakih is located in East Bali on the southern slope of Mount Agung, around an hour by car from Ubud. Public transportation including buses and bemos (minivans) is available from both Denpasar and Ubud, however many people choose to join a tour or hire a private driver. The last bemo back to Denpasar leaves the temple around 3 p.m.
Ubud and You: Read about other things to do near Ubud. Pura Besakih can also be reached from the Kintamani region in North Bali by driving south along the road to Rendang and Klungkung; the scenic drive takes around an hour. If comfortable enough on a motorbike, scooters can be rented in Ubud for around $5 per day. Having your own transportation is a big plus for exploring the various temples and scenic drives along the slopes of Mount Agung. Yawning Glory: Read about Goa Gajah, the Elephant Cave, another sacred Hindu site in Bali.